CHAUVET® DJ has announced the introduction of the simple-to-use, battery-powered EZ™ series to its collection of wireless up-lighting. The new compact and lightweight series, which includes the EZrail™ RGBA batten and EZpar™ 64 RGBA PAR can, eliminates the hassle of running cables, speeds up the set up process and can be controlled wirelessly using the included IRC remote. The EZrail™ RGBA and EZpar™ 64 RGBA fixtures emit stunning pastels and rich colours to create the perfect lighting package at any event. 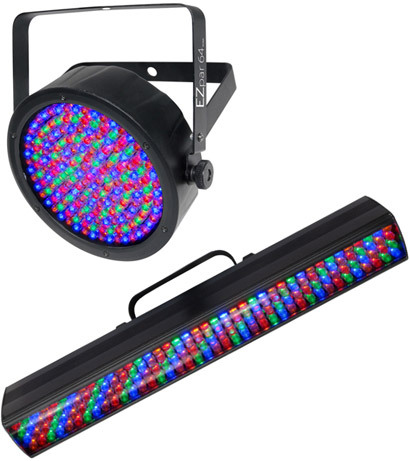 Ideal for area washes and up-lighting, the EZrail™ RGBA includes 160 RGBA LEDs and is controllable in up to four sections for enhanced effects. Fitted with 180 RGBA LEDs, the EZpar™ 64 RGBA is a powerful, ultra-slim wash light designed to fit in most places other fixtures cannot. It is available with a black or white casing to easily blend into any environment such as wedding venues, band setups and any other type of mobile application. Place EZpar™ 64 RGBA fixtures against a wall as a powerful wash or position them inside a stick of TRUSST® as a truss warmer. Since both fixtures are incredibly lightweight — the EZrail™ RGBA weighs 2.6kgs, while the EZpar™ 64 RGBA weighs 1.9Kgs — mobile entertainers can easily transport multiple units. To simplify setup, these lightweight wash lights include a rechargeable lithium-ion battery that runs for up to 20 continuous hours. By eliminating the need to run messy cables, the EZ™ series allows for quick and easy set up and teardown while providing a safe environment for event guests and staff without tripping hazards. For convenient control, the EZ™ series features a built-in, easy-to-read LED display to create precise colours and access automated programs without using the wireless remote or a DMX controller. For a second form of wireless non-DMX control, the included IRC remote allows easy point-and-shoot operation. Obviously the EZ™ series can also be paired with a DMX controller and a choice between two DMX modes (4 or 8 channel) is provided.